Bronen, a lawyer, professor at the University of Alaska Fairbanks, and executive director of the Alaska Institute for Justice, says average temperatures have risen 3.5oC since 1975 across the state – well over the 2oC limit proposed by many experts. As sea ice melts, permafrost thaws, erosion accelerates, and extreme weather worsens, peoples’ livelihoods have been disrupted, particularly in small communities. In 2003, about 86 percent of indigenous villages were affected by increased flooding and erosion. The last federal survey of those communities (229 in total) found that over a six-year period, the number actively seeking to relocate had quadrupled, she says. Bronen has encouraged state and federal leaders to begin building frameworks that will enable populations to resettle together. No government agency is currently charged with relocation, meaning communities cannot access funding or guidance for their transition, she says. The Stafford Act, which guides most federal disaster activities, actually requires the Federal Emergency Management Agency to rebuild communities in the same place, even if that means they remain in a disaster zone. In 2006, the federal government constructed a multi-million dollar sea wall to protect the community of Kivalina from erosion, for example. The day it was completed, a storm destroyed 180 feet of the wall and within a year nearly two-thirds of the community was evacuated in the wake of another storm. These laws and policies may have originally been designed to protect people, but climate change is rendering some of them obsolete, she says. The community of Newtok, for example, faced a legal Catch-22 when it attempted to relocate to an unoccupied area in 2003. To receive state or federal funding for a school, a community is required to have at least 10 students ready for enrollment, but families were unwilling to relocate without a school already in place. Although progress at the federal level has been slow, Bronen says she’s encouraged by the dynamism and creativity she’s seen among the communities she serves. 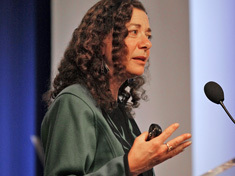 Robin Bronen is a member of the Global Resilience Academy and spoke at the Wilson Center on December 4. Download her slides to follow along. Topics: adaptation, Arctic, climate change, community-based, disaster relief, environment, environmental security, flooding, Friday Podcasts, humanitarian, livelihoods, migration, podcast, resilience, U.S.